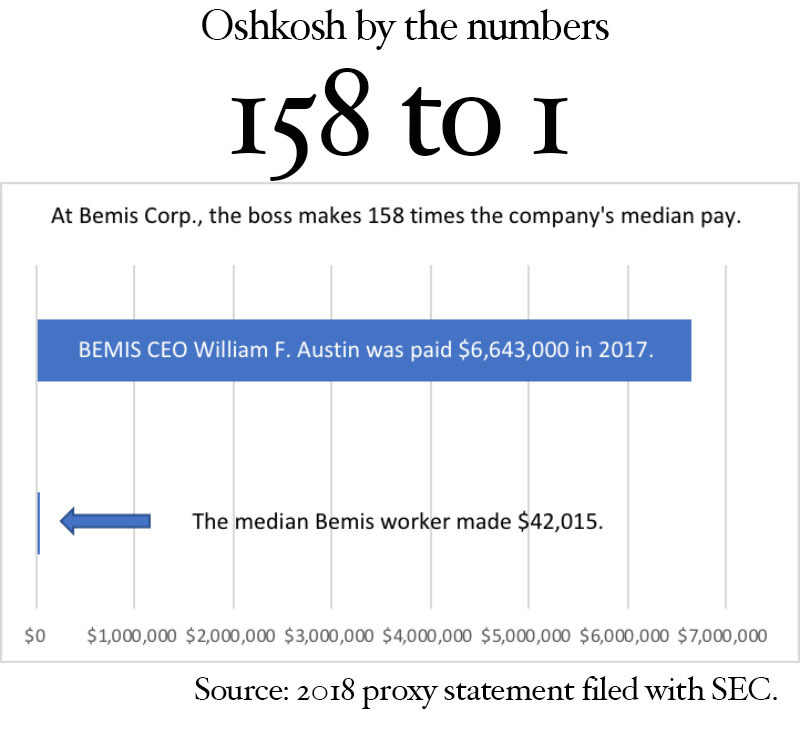 Thanks to new federal rules, the estimated 2,300 people who work for Bemis Corp. in Oshkosh can now see how their pay compares to that of their peers and to that of their biggest boss. Bemis is Oshkosh's second largest employer, according to statistics compiled by the city. In 2017 the CEO, William F. Austen, was paid $6.6 million, according to a document that the company filed with the U.S. Securities and Exchange Commission. That same document shows that the median pay for a Bemis employee throughout the company was $42,015. These disclosures reveal that the CEO pay at Bemis was 158 times that of the median worker. Companies across the country have been making similar disclosures this year because of a provision in the Dodd-Frank Wall Street Reform and Consumer Protection Act, which was passed in the wake of the financial crisis of 2008. Bemis saysthat its pay ratio is actually in line with or below the ratios released by similar companies in the Midwest and in the packaging industry generally. But for all companies that have reported as of July 2, Bemis is well above the median number of 65, as calculated by Equilar, a company that provides data services for boards of directors. The lowest ratio so far has been reported by Google, where the CEO is paid just $1 a year and the median worker gets $197,274. At the high end of the scale is McDonald's which relies mostly on part-time workers and paid its CEO $21.8 million last year. McDonald's pay ratio was 3,101 to 1. Companies have some leeway in how they calculate median pay, which can make comparisons among companies somewhat imprecise. Bemis said it calculated median pay by "including base pay, shift differential, overtime, bonus, 401(k) match, perquisites and similar other compensation elements." Austen's 2017 compensation was bit lower than it was in 2016, when he earned $6.99 million, according to SEC records. Bemis reported net income in 2017 of $94 million, compared to $236.2 million for 2016. From time to time the Oshkosh Examiner will present similar information from other large local employers.